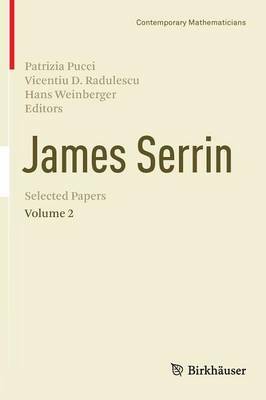 These two volumes present the collected works of James Serrin. He did seminal work on a number of the basic tools needed for the study of solutions of partial differential equations. Many of them have been and are being applied to solving problems in science and engineering. Among the areas which he studied are maximum principle methods and related phenomena such as Harnack's inequality, the compact support principle, dead cores and bursts, free boundary problems, phase transitions, the symmetry of solutions, boundary layer theory, singularities and fine regularity properties. The volumes include commentaries by leading mathematicians to indicate the significance of the articles and to discuss further developments along the lines of these articles.